When storage space is at a minimum, think about decorations such as wire ribbon or filling existing vases with elegant ornaments or oranges. It’s officially the holiday season and your condo should reflect this joie de vivre. You may think that condo decorating is the same as house decorating but that is just not the case. With a condo, not only do you have less storage space, you also have less floor space. 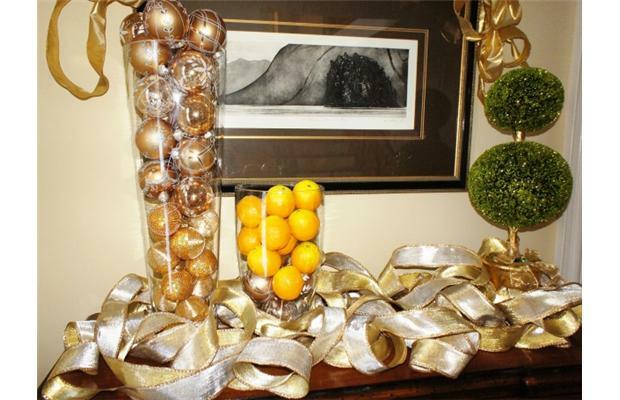 This is why the key to holiday decorating is streamlining your decor. Instead of filling your condo with things that take up room on tables and the floor, like nutcrackers and mini Christmas villages, try hanging things. Displaying wreaths, for example, can be a beautiful way of showing off your holiday spirit. And they can be tailored to your taste to allow personal style to show through. For instance, purchase or create wreaths with pine cones, ribbon, rosemary or holly. Check out marthastewart.com for DIY wreaths. A string of twinkle lights is another accessory that will shine. Holiday lights are the perfect accent for high-profile areas. Place them above the sink or in alcoves, on mantels or around doorways or mirrors. They are guaranteed to introduce cheer to small spaces. Why not take advantage of your dormant outdoor space for holiday displays? Wind miniature lights around your railing or deck your deck with a small fir tree covered in lights to make things festive and add visual space. You can save even more space (and money) by considering this to be your main tree instead of buying one for your living room. It’s important to bring holiday cheer to all the senses. A wonderful way to bring the smell of the holidays into your condo is with whole cloves and beautiful oranges, sticking the cloves into the oranges in patterns. Not only will this make a fantastic centrepiece or counter display but the sweet smell will also tantalize your sniffer. One holiday accessory you simply cannot do without is music. Create a holiday mix with your favourite seasonal tunes and play it in the background all day long. Some of my favourite holiday music includes Michael Bublé’s album Christmas and Diana Krall’s relaxing Christmas Songs. These make wonderful background music for dinner or general listening. If you have a favourite artist, check if he or she has released a holiday selection as artists as diverse as U2, Kenny G, and Dave Matthews have contributed to this genre. Another thing to remember if you’re in a condo is that you should be careful not to go overboard with decorating as storage can be an issue. Remember that you will have to keep your decorations packed away for most of the year. Pass on purchasing that expansive manger scene or 10-foot menorah. There are many ways to maximize your decorating while minimizing storage space. One way is to decorate with beautiful high-end wired ribbons. Wired ribbon in gold or silver is festive and magical and requires no storage space. Remember large collections of nutcrackers or window displays may be a logistical challenge for the rest of the year. I love nutcrackers but keep them in condo scale. Why not try filling an existing large vase or bowl with elegant ornaments — silver and gold are my favourites. Remember, ornaments can be fragile and may require extra protection, using up your limited storage space. For beautiful ornaments and other accessories, check out Pier 1 Imports in store or online at pier1.ca. When decorating your condo remember that less is more: A little decoration will go a long way in a small interior space. Don’t forget that what you decorate with will be occupying valuable storage space the rest of the year. Use your condo sense when decking the halls and have a happy holiday. Oh, and since most condos will not have a chimney, you might have to get creative with your cookie placement. But don’t worry, Santa will find them. Marilyn Wilson has been selling real estate for more than 23 years and owns Marilyn Wilson Dream Properties Inc. Brokerage in Ottawa, an Exclusive Affiliate of Christie’s International Real Estate. She can be reached through dreamproperties.com or follow her on Twitter: @marilyn_wilson.